Starting with version 3.4, MongoDB added support for the creation of read-only views from existing collections or other views. Views use indexes of the underlying collection. Views are computed on demand during read operations, and MongoDB executes read operations on views as part of the underlying aggregation pipeline. Views are considered sharded if their underlying collection is sharded. More info can be found here. 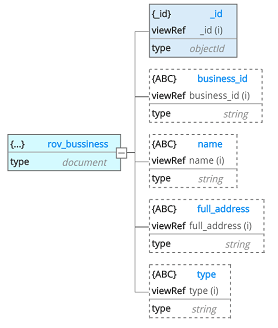 In Hackolade, views constitute another type of object in the Entity Relationship Diagram, alongside collections. They are visually distinguished by the dotted-line box plus the icon in the top left corner. 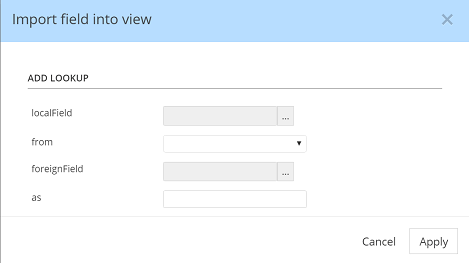 As per MongoDB's capabilities, a view is based on a particular collection, with the ability to create joins to other collections via the $lookup function. The capability to build views on top of other views is not currently supported. The localField represents the foreign key upon which the $lookup will perform the matching with the foreignField in the foreign collection. 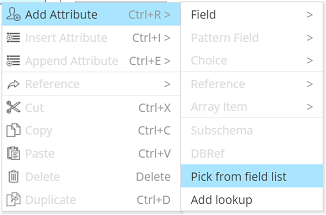 If your model already contains relationships, the from and foreignField entries will get automatically field in. You still need to define the name you wish in the 'as' parameter. 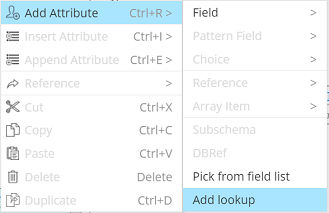 When you click 'Apply', the application will fetch all the fields of the foreign collection, add them to the tree view and update the pipeline expression. You may now suppress and/or reorder foreign fileds in the view.